I fondly remember the death of Richard M. Nixon, on Earth Day, 1994, like the planet finally taking out trash gone rancid decades ago. It’s rare that a death makes me happy, but this one did. He was an actively evil man who got away with it and died old and free with a clear record. In the liner notes to Winter In America, Gil Scott-Heron made the earliest on-record call for the impeachment of Richard Nixon that I am personally aware of. There may be an earlier one, but I haven’t seen it, though I have seen later ones which claimed to be first. The same country that showed Nixon mercy because he had phlebitis showed Gil Scott-Heron–who said of phlebitis, “Rats bite us. No pardon in the ghetto”–to prison for crack addiction. Gil Scott-Heron died too young on parole with a felony record. The consoling notion that “history will judge harshly”…reflects the same complacent idealism that could be found in one of President Barack Obama’s most over-used lines: “The arc of the moral universe is long but it bends toward justice.” (Often attributed to Dr. Martin Luther King Jr., who quoted it in his writings, the aphorism originated with Theodore Parker, a nineteenth century Unitarian minister and abolitionist.) Sunnily optimistic this sentiment may be, it has, in Obama’s formulation, come to be associated more with rudderless left-of-center politics—think of the reluctant drone warrior “evolving” on gay marriage—than a courageous moral vision. It asks nothing of us but to wait out the clock until justice, somehow, wins. In the meantime, the oceans rise, prison camps are being built for migrant children, and sitting congressmen like Steve King promote neo-Nazis on Twitter. Either way, does it ask “nothing of us but to wait out the clock until justice, somehow, wins”? Let me guide you to the answer I find true by offering a second question: Do you believe Theodore Parker intended to “ask nothing of us but to wait out the clock”? Parker’s example says otherwise. He was among the Boston Vigilance Committee, which actively resisted slavecatchers. * They smuggled people to freedom and they rioted to free them from their kidnappers. They made Boston a no-go zone for enslavers. Theodore Parker died even younger than Gil Scott-Heron, of tuberculosis and overwork, indicted but never convicted. He left the world a better place than he found it, made Boston a better city, and had a personal hand in the liberation of many enslaved people. History hasn’t always been kind to Parker. Unitarian Universalists have decidedly mixed feelings about their abolitionist history. The cause was righteous, but the means weren’t always peaceful. The most famous hymn** written by a Unitarian, “The Battle Hymn of the Republic”, isn’t in our hymnal. I’ve had people look me in the eye and tell me that Parker’s willingness to use and to justify the use of violence to liberate the enslaved drained his spiritual value. I’m not sure what could be more spiritual than to free the enslaved. Parker doesn’t need history to save him, though. He didn’t then and he doesn’t now. History may or may not save Parker, but Parker saved many from enslavement. If Parker and his cohorts needed salvation–from a citizen’s complicity, perhaps, in crimes committed against humans by the state–then they gained it from their moral action in a time of crisis. It’s not like that washes away all sin and wrongdoing–Parker still has his flaws. Read him if you don’t believe me–but it does save him from being only the sum of his errors. So supposing, just supposing, you might live during a time when the thought “What will save me?” is on your mind. What you do to save others will save you. It isn’t guaranteed to end your fear. It may not save you from what threatens them. It may even put you in its path. But if you look at this world’s optional horrors–not the inevitable sadnesses and tragedies, but the cruelties and indignities inflicted by choice–and say, “If I allow this to go on without resistance, then I am lost”, what you do to save others will save you. *An aside: Note the very modern usage in this sentence fragment “To secure justice for a man claimed as a slave by a Virginia kidnapper!” The victim of the crime is not defined as a slave, but a man claimed as a slave. 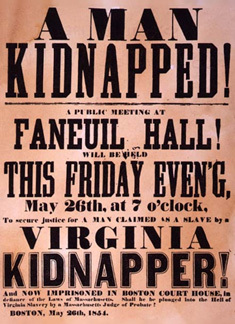 The enslaver is the one defined by his role as a kidnapper. **As opposed to Christmas songs. We write those by the bushel!